Web development is not an easy task but thanks to Firefox addons that makes development faster and easier. 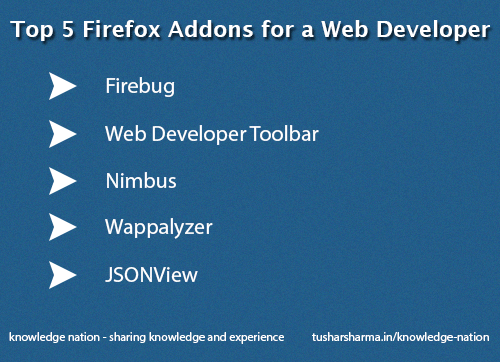 Today I am gonna talk about some of the firefox addons which I used for web development. It is used to uncover the technogies used on the website. It can detect several CMS, server side languages, JS and CSS libraries, analytics code and many more. It prettifies json in the browser. It comes very handly while creating web application using JSON Api’s. Install plugin and check for changes here. That all for today guyz, I hope these “Top 5 Firefox Addons for a Web Developer” will help you in increasing you productivity.